The progression of breast cancer from early-stage to metastatic disease results from a series of events during which malignant cells invade and travel within the bloodstream to distant sites, leading to a clonogenic accumulation of tumor cells in non-breast tissue. While mechanistically complex, an emerging literature supports hemostatic elements as an important patient factor that facilitates the metastatic potential of breast cancer. Hemostatic elements involved include platelets, coagulation, and fibrinolysis. Key steps in breast tumor progression, including cellular transformation, proliferation, tumor cell survival, and angiogenesis, can be mediated by components of the hemostatic system. Thus, the hemostatic system provides potential targets for novel therapeutic approaches to breast cancer therapy with drugs in current use and in development. The present article provides a comprehensive overview of the evidence and mechanisms supporting the roles played by platelets, coagulation activation, and the fibrinolytic system in breast cancer progression. Like the host tumor microenvironment and immune response, the host hemostatic system represents one of several patient factors now recognized as important in both the control and progression of malignancy. In women with breast cancer, the relationship between the tumor and the hemostatic system is increasingly recognized as an important regulator of breast cancer progression. In fact, elements of the hemostatic system, including platelets, coagulation, and fibrinolysis, can affect many of the processes known to mediate breast cancer progression. For example, clearly defined cancer hallmarks such as sustained proliferation, evasion from immune-mediated destruction, apoptosis prevention, angiogenesis, tumor invasion, and metastasis  are directly impacted by elements of the hemostatic system. We review the available evidence that suggests a reciprocal interplay between breast cancer and the hemostatic system and delineate the important role played by platelets, coagulation, and fibrinolysis components in each step of tumor growth and metastasis in patients with breast cancer (Figure 1). In addition, we will highlight potential hemostasis-targeting strategies that may be of therapeutic benefit in patients with either early or later stages of the disease. Importantly, many laboratories have contributed significantly to our understanding of the potential role of the hemostatic system in the progression of a variety of cancers by using various tumor models. Although this evidence is undoubtedly important and robust, we have focused, in this review, only on laboratory, murine, and clinical models that involve breast cancer. An overview of important interactions between hemostasis and breast cancer. (1) Hypoxia and oncogenic activation increase tissue factor expression, which increases urokinase-type plasminogen activator (uPA) expression and transcription in tumor cells, facilitating intravasation. (2) Tumor cell-induced platelet aggregation leads to platelet activation. Activated platelets subsequently shed microparticles, release various growth mediators, and protect tumor cells from immune-mediated destruction in circulation. (3) Platelets help in adhesion of tumor cells through p-selectin and integrins, aiding in extravasation from the circulation. (4) Thrombin generated through TF-FVIIa-Xa pathway upregulates growth-related oncogene-alpha (GRO-a) and leads to secretion of matrix metalloproteinase (MMP) and angiogenic molecules. (5) Tissue factor, platelets, thrombin, and the plasminogen system enhance tumor growth, invasion, and angiogenesis, leading to clonogenic accumulation of tumor cells outside breast tissue. FVIIa, activated factor VII; TF, tissue factor. An increased risk of thrombosis as well as increased platelet activation has been observed for decades in women with breast cancer, but until recently, these clinical observations have been considered a paraneoplastic phenomenon [2–6]. In women in whom breast cancer has been diagnosed, an increased circulating platelet count (thrombocytosis) is associated with a poor cancer prognosis, suggesting a potential direct role for platelets in the pathogenesis of the disease [7, 8]. Analogous to the recent elucidation of the role of platelets in inflammation, wound healing, and sepsis, experimental and clinical evidence now suggests that platelets may play a role in breast cancer progression [9, 10]. The relationship between platelets and breast cancer metastasis has been recognized since 1968, when Gasic and colleagues  demonstrated, in an animal model, a 50% reduction in tumor metastasis after experimental thrombocytopenia induced with neuraminidase and anti-platelet serum. This anti-metastatic effect was effectively reversed with infusion of platelet-rich plasma (blood plasma enriched with platelets obtained by centrifugation and removal of red blood cells). Since that time, numerous studies have contributed to our understanding of the role of platelets in multiple steps in breast cancer progression. Platelet roles in breast cancer progression, including increased survival of disseminated cancer cells within the circulation, tumor cell adhesion to the endothelium, extravasation into the parenchyma of distant tissues, and ultimately the growth of tumor cells at meta-static sites, are reviewed below [5, 9, 12–17]. In response to stimuli, platelets undergo a process of activation that leads to shape change, small-molecule and protein release, and membrane-based changes. At least two markers of platelet activation - B-thromboglobulin and P-selectin - are increased in the blood of patients with breast cancer, suggesting that ongoing platelet activation occurs in these patients [5, 16]. One mechanism of platelet activation is tumor cell-induced platelet aggregation (TCIPA). Importantly, the ability of breast tumor cells to induce platelet aggregation correlates with their metastatic potential [6, 18]. TCIPA can occur via direct contact with tumor cells or by various mediators like ADP, thromboxane A2, or serine proteinases, including thrombi [19–21]. For example, in the laboratory, ADP released from MCF-7 breast cancer cells has been found to induce platelet aggregates via activation of the platelet P2Y12 receptor . TCIPA has also been shown to enhance expression of glycoprotein (GP) Ib and IIb/IIIa receptors not only on platelets but also on breast cancer cells , and antibodies against GPIb and GPIIb/IIIa can inhibit platelet aggregation by breast cancer cells and attenuate metastasis [19, 22]. Additional mechanisms of platelet activation include the generation of matrix metallo proteinases (MMPs) by breast cancer cells and general activation of the coagulation system (reviewed below and in ). Once activated, platelets as well as factors released from them promote metastasis by increasing survival of cancer cells within the circulation and facilitating adhesion to the endothelium, extravasation, and ultimately the growth of tumor cells at metastatic sites [8, 9, 12–17, 23, 24]. Additionally, platelets can shed microvesicles (platelet microvesicles) from their surface following activation and this can further enhance breast cancer cell adhesion, proliferation, chemotaxis, and chemoinvasion via several mechanisms . As cancer cells intravasate into the circulation, they are subject to a hostile environment resulting from immunological assault by natural killer (NK) cells and shear forces, which threaten their survival. Research using various in vivo and in vitro tumor models has shown that platelets can increase metastatic success via multiple mechanisms, including direct shielding of tumor cells, protection of tumor cells from tumor necrosis factor-alpha (TNF-α)-mediated cytotoxicity, and facilitation of downregulation of NKG2D (immunoreceptor natural killer group 2, member D) via platelet-derived transforming growth factor-beta (TGF-β) [9, 26]. Studies in breast cancer models have shown that direct interaction between breast cancer cells and platelets results in the activation of the TGF-β signaling pathway, which promotes metastasis, and invasion by inducing epithelial-to-mesenchymal transition and immunosuppression [14, 27]. Placke and colleagues , using an ex vivo breast cancer model, found that platelets can transfer their MHC (major histocompatibility class 1) antigens to tumor cells and provide a pseudonormal phenotype to embolic tumor cells to help evade NK cell-mediated destruction. A recent study using a murine model also found that platelets promote breast cancer metastases in a time-dependent manner; however, NK cell destruction of circulating tumor cells was not affected by platelets . In the circulation, an interaction between breast tumor cells and platelets, leukocytes, and endothelial cells occurs through numerous cellular proteins and receptors (reviewed in ). Generally, this interaction facilitates metastasis by promoting arrest of tumor cells in the circulation and extravasation at distant sites [19, 29]. Two platelet receptors are particularly important in this process: p-selectin and GPIIb/IIIa (also known as αIIbβ3); these receptors are discussed further below. In addition to these two important platelet receptors, exposed collagen IV on tumor blood vessels has been shown to facilitate platelet recruitment in the tumor microenvironment and has been considered a marker for angiogenesis in breast cancer [17, 30]. The selectins are a family of adhesion molecules that mediate loose tethering engagement between tumor cells, platelets, leukocytes, and endothelial cells . P-selectin is a cell adhesion molecule stored in the Weibel-Palade bodies of endothelial cells and the alpha granules of platelets. P-selectin expression occurs on the platelet surface following their activation. Chondroitin sulfate glycosaminoglycan (CS-GAG) and CD24 are the major P-selectin-reactive ligands on the surface of breast cancer cells and their enhanced expression correlates with cancer progression and poor prognosis [17, 29, 32]. Selectin deficiency and removal of CS-GAG have been recently shown to reduce spontaneous metastasis in experimental and mouse models of breast cancer and provide an attractive treatment target [28, 29, 32]. Stubke and colleagues  have further found that selectin deficiency reduces but does not completely abrogate metastasis in a xenographic model of human breast cancer cells, suggesting a role for additional adhesion molecules. Coupland and colleagues  showed that, in a mouse model of metastatic breast carcinoma and melanoma, platelet-derived p-selectin promotes lung metastasis and platelet depletion reduced lung metastasis in both the presence and absence of NK cells. These observations suggest that P-selectin and p-selectin ligands may be important targets in breast cancer therapy. Selectin-mediated loose tethering is followed by firm adhesion of tumor cells to endothelium through upregulation of integrins . Integrins are a family of transmembrane adhesion receptors composed of non-covalently linked α and β subunits. TCIPA increases surface expression of platelet integrin GPIIb/IIIa (αIIbβ3) . Another integrin, αvβ3, is highly expressed in patients with metastatic breast cancer and correlates with cancer progression and metastatic phenotype in breast cancer . Interactions between platelet integrin αIIbβ3 and tumor cell integrin αvβ3 in the presence of connecting plasma proteins such as fibrinogen leads to arrest of tumor cells in circulation . Anti-αIIbβ3 and anti-αvβ3 can abolish arrest of breast cancer cells and help control metastasis . Matrix degradation by proteases is crucial for the processes of tumor cell invasion into the surrounding stroma and extravasation into blood vessels. Early work by Belloc and colleagues  in 1995 showed an increase in the invasiveness of human mammary tumor cells after exposure to platelets. 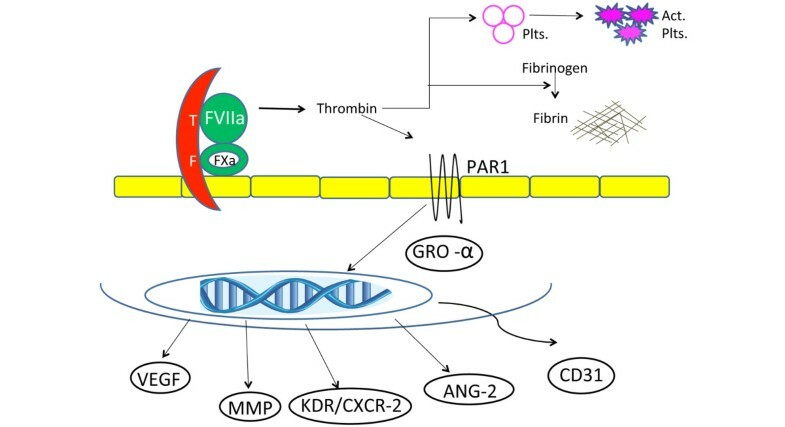 Subsequently, activated platelets have been found to promote extravasation and an invasive phenotype in breast cancer through the release of MMPs from their alpha granules, the generation of MMPs from tumor cells, and the secretion of a plethora of important growth factors and enzymes like TGF-β, vascular endothelial growth factor (VEGF), platelet-derived growth factor (PDGF), and lysophosphatidic acid (LPA) that affect vascular integrity [6, 14–16, 18, 34]. Direct signaling between platelets and breast cancer cells has been found to induce tumor cells to undergo an epithelial-to-mesenchymal-like transition, a transient and reversible process that promotes metastases by enhancing tumor cell motility, invasion, and dissemination of cancer cells out of the tumor microenvironment, in a breast tumor cell model . In this model, platelet-derived TGFβ and direct platelet-tumor cell contacts synergistically activated the TGF-β and NF-κB (nuclear factor kappa-light-chain-enhancer of activated B cells) pathways in cancer cells leading to tumor epithelial-mesenchymal transition (EMT). EMT leads to down-regulation of E-cadherin and increased production of plasminogen activator inhibitor-1 (PAI-1), fibronectin, MMP-9, and multiple other factors that promote migration and invasion by breast cancer cells . Tumor growth is dependent on the development of new blood vessels (angiogenesis). In patients with breast cancer, tumor cells may remain dormant at secondary sites for long periods in the absence of angiogenesis . During cancer growth, the exquisite balance between pro- and anti-angiogenic factors is disrupted and results in a pro-angiogenic microenvironment contributing to progression and invasiveness [16, 17, 23]. Platelets store more than 30 angiogenesis-regulating factors. These factors can be pro-angiogenic such as VEGF, fibroblast growth factor (FGF), PDGF, epidermal growth factor (EGF), hepatocyte growth factor (HGF), insulin-like growth factor (IGF), CD40 ligand, matrix metallo-proteinases (MMP-1, MMP-2, and MMP-9), gelatinase A, and heparanase or can be anti-angiogenic such as angiostatin, thrombospondin-1, platelet factor-4, endostatin, TGF-β, and tissue inhibitor of matrix metalloproteinases (TIMP) [16, 23, 24, 35, 36]. VEGF is the most extensively studied pro-angiogenic protein, and the platelet pool comprises more than 80% of total circulating VEGF in healthy subjects as well as patients with cancer, including those with breast cancer [36, 37]. In ex vivo models of platelet activation, angiogenic proteins are selectively released on the basis of differential platelet receptor activation by various agonists, suggesting that platelets may actively stimulate or inhibit angiogenesis [23, 35, 38]. Breast cancer cells have also been shown to prime platelets to release pro-angiogenic proteins which stimulate migration and proliferation of endothelial cells . Platelets have also been shown to maintain vascular integrity in murine models of breast cancer and prevent intratumor hemorrhage and subsequent cell death . Recently, Demers and colleagues  showed that in a mammary carcinoma murine model, thrombocytopenia (low platelet count) resulted in increased tumor leakiness and facilitated the delivery of chemotherapeutic agents to tumors, thereby increasing drug efficacy. These data suggest that platelet function and number likely play a role in modulating the tumor vasculature. Table 1 summarizes the current findings with regard to the role of platelets in breast cancer progression within the context of hallmarks that generally define cancer pathogenesis. The preponderance of the data to date suggests that anti-platelet therapy might be best used to prevent or attenuate metastatic spread. However, there is a paucity of clinical studies addressing the clinical utility of anti-platelet strategies in breast cancer control, and most inferences about platelet-inhibitory drugs (for example, aspirin) in cancer prevention have been extrapolated from meta-analysis of data from cardiovascular trials. Table 2 provides a summary of the clinical data from cancer-specific trials. A potentially important study is the Nurses' Health Study, which reported an association between aspirin use and a decrease in distant recurrence and improved survival in women with breast cancer who had survived a minimum of one year following a cancer diagnosis . These data complement numerous studies in the literature that suggest a potential benefit for aspirin use in the primary prevention of breast cancer . However, the clinical benefit of aspirin in patients with cancer has been linked to inhibition of cyclooxygenase in tumor cells, and inhibition of platelet activation has not been widely cited as a potential mechanism of action in these studies. Currently available oral anti-platelet agents in addition to aspirin include ADP receptor antagonists (such as clopidogrel and prasugrel) and dipyridamole, a pyrimidopyrimidine derivative that blocks platelet uptake of adenosine and inhibits cyclic AMP phosphodiesterase . These drugs inhibit platelet activation, are relatively well tolerated, and have a known safety profile. Use of these drugs may be of particular appeal to improve the survival of women with metastatic disease . Combining these drugs with hormonal therapy and targeted therapy that does not produce thrombocytopenia would also be compelling in the clinical trial setting. A single murine study has suggested that aspirin use may be of benefit in a subset of patients with luminal breast cancer ; however, clinical studies are needed and are an important avenue of future research. Exploration of platelet receptor-specific inhibition and the effects on tumor progression in the metastatic and adjuvant settings is also exciting potential future research opportunities given the new drugs under development in the cardiovascular setting (for example, PAR-1 platelet inhibitors). Enhanced activation of the coagulation system has been demonstrated in women with breast cancer and has long been associated with an increase in systemic venous thromboembolism (VTE) rates and decreased survival in these patients [2, 3]. Treatments for breast cancer, including surgery, hormonal therapy, and chemotherapy, contribute to and enhance this hypercoagulable state (reviewed in ). A significant body of evidence has established that coagulation activation is not just an epiphenomenon in breast cancer progression but is also an important regulator of malignant transformation, tumor angiogenesis, and metastasis. The major components of the coagulation system that play a role in breast cancer progression include tissue factor (TF) and thrombin. TF is a 47-kDa transmembrane glycoprotein that serves as the primary cellular initiator of the extrinsic coagulation pathway by acting as a ligand for factor VII/VIIa and ultimately activating factor × (reviewed in ). Research has shown that the TF/fVIIa/fXa complex, beyond its traditional role of maintaining vascular hemostasis, also plays an important role in breast cancer progression [46, 47]. TF-mediated coagulation not only leads to thrombin generation and contributes to the procoagulant phenotype seen in patients with breast cancer but also activates intracellular signaling events by binding to protease-activated receptors 1 and 2 (PAR-1 and PAR-2) that contribute to several tumor-related processes, including cell growth, motility, invasion, angio genesis, and anti-apoptotic effects . In contrast to full-length tissue factor (flTF), invasive breast cell lines have also been shown to produce a shorter and more soluble isoform, termed asTF (alternatively spliced TF) . asTF increases the migration and invasion in breast cancer cell lines and, in other tumor models, has been shown to induce tumor angiogenesis as well by binding to integrins independent of fVIIa . Clinically, TF is frequently overexpressed by the tumor cells of patients with breast cancer and correlates with a poor prognosis and decreased survival [47, 49]. In human breast cancer, PAR-2 and TF upregulation have been shown to be associated with a marked phosphorylation of the TF cytoplasmic domain (pTF). Ryden and colleagues  found that, in patients with primary breast cancer, co-expression of PAR-2 and VEGF-A was associated with a more aggressive tumor phenotype as indicated by a correlation to higher histological grade (PAR-2 and VEGF-A) and estrogen receptor negativity (VEGF-A). Additionally, pTF and PAR-2 correlated with a shorter recurrence-free survival in patients with breast cancer, supporting the important role of TF in breast cancer progression . During tumorigenesis, not only is TF expression upregulated on tumor cells but also increased expression is observed on tumor vasculature endothelial cells and monocytes [47, 50, 51]. Furthermore, tumor cells also shed TF-bearing microparticles that contribute to tumor progression and hypercoagulability [46, 47, 52, 53]. Suppressing TF activity with anti-TF antibodies or all trans-retinoic acid can induce apoptosis and inhibit metastatic spread of human breast cancer cells [54–57]. Additionally, TF/VIIa complex can be used for selectively delivering target drug to TF-overexpressing cancer cells to enhance therapeutic efficacy and reduce toxic side effects . These findings suggest that TF can play a critical role in breast cancer biology and progression. TF expression in the breast cancer microenvironment is a complex process and appears to be regulated in part by oncogenes, hypoxia, and TGF-β. Oncogenic activation of human epidermal growth factor receptor-2 (HER-2) and epidermal growth factor receptor (EGFR) enhances TF expression on breast cancer cells, and trastuzumab and cetuximab (monoclonal antibodies to HER-2 and EGFR, respectively) as well as the EGFR inhibitor, erlotinib, can inhibit such a process, leading to less invasive phenotypes and decreased migration of breast cancer cells in vitro [48, 59]. On the other hand, microRNA-19 (miR-19) can downregulate TF expression in breast cancer cell lines and is highly expressed in MCF-7 cells (a weakly invasive breast cancer cell line) compared with MDA-MB-231 cells (a highly invasive cell breast cancer cell line) . Hypoxia not only increases the expression of TF but also enhances ectopic synthesis of its ligand FVIIa in breast cancer cells via hypoxia-inducible factor-2α (HIF-2α) . Furthermore, breast cancer cells induce the expression of TF on vascular endothelial cells and stromal cells associated with cancer cells via production of VEGF and TGF-β (an essential cytokine for EMT), respectively [50, 62]. Additional mutant oncogenes (such as MET and PML-RAR-alpha) or loss of tumor suppressor genes (like PTEN and p53) have been shown to alter expression of TF and other mediators of cancer coagulopathy (PAI-1 and cyclooxygenase) in an oncotype-specific manner . Enhanced cell migration and resistance to apoptosis are two important steps in metastasis and tumor growth. TF and TF complexes have been found to contribute to both of these processes (Figure 2). In vitro studies have demonstrated that the TF-VIIa-Xa complex promotes breast cancer cell migration through PAR-2 signaling and subsequent activation of mTOR (mammalian target of ripamycin) and MAPK (mitogen-activated protein kinase) pathways in the cancer cell [51, 64, 65]. TF/VIIa also enhances migration via induced transcription of interleukin 8 (IL-8) and colony-stimulating factor 1 (CSF-1) [51, 65]. Tissue factor-FVIIa-PAR2 complex-related intracellular signaling. Binding of activated factor VII (FVIIa) leads to proteoyltic cleavage of protease-activated receptor-2 (PAR-2), resulting in loss of negative regulatory control of PAR-2-mediated signaling through phosphorylation of TF cytoplasmic domain. This leads to activation of mitogen-activated protein kinase (MAPK) pathways and PI3K/Akt/mTOR activation. These pathways lead to subsequent gene transcription and result in the production of various mediators like vascular endothelial growth factor (VEGF), interleukin-8 (IL-8), colony-stimulating factor-1 (CSF-1), urokinase-type plasminogen activator (uPA), plasminogen activator inhibitor (PAI), and survivin. These mediators then play an important role in angiogenesis, tumor growth, invasion, and increased survival. mTOR, mammalian target of ripamycin; P, phosphate; PI3K, phosphatidylinositol 3 kinase. The serine protease, thrombin, is generated via proteolytic cleavage from inactive prothrombin by factor Xa (fXa) in the prothrombinase complex and leads to blood clot formation to provide hemostasis during vascular damage. Thrombin converts fibrinogen to fibrin to stabilize blood clots and activates platelets which augment additional thrombin formation. Thrombin signaling activates G-protein-coupled PARs on cell surfaces to mediate some of its effects . The generation of thrombin is central to blood clot formation in both healthy patients and those with cancer. 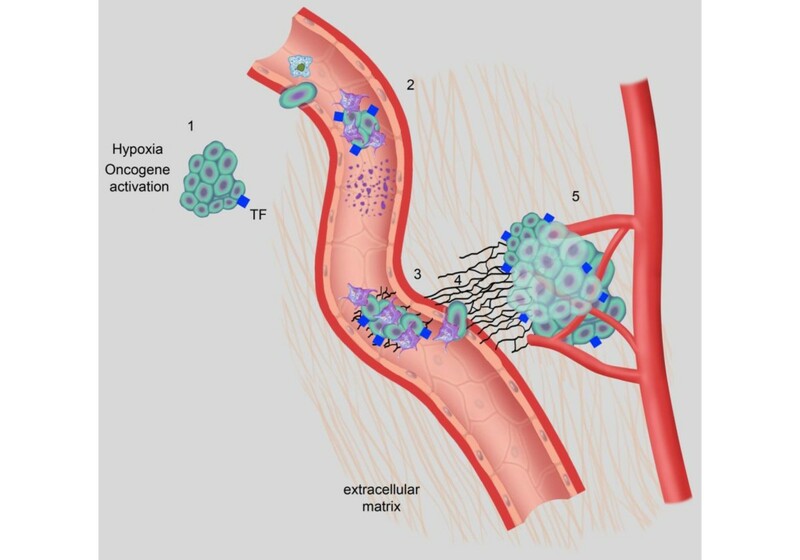 Some metastatic models of breast cancer have suggested that, in addition to TF, thrombin plays a pivotal role in the malignant potential and metastasis of breast cancer cells. In these studies, thrombin increased the invasiveness of breast cancer, and thrombin receptor (PAR-1) overexpression has been reported in invasive phenotypes in breast biopsy specimens from patients as well as in xenographic models [67, 68]. Hirudin, a potent and specific inhibitor of thrombin, has been shown to decrease tumor implantation, seeding, and spontaneous metastasis, supporting the notion that tumor cell-induced endogenous thrombin plays a significant role in the progression of breast cancer . Additionally, in at least one laboratory model, a direct thrombin inhibitor (dabigatran) has been shown to inhibit both invasion and metastasis of malignant breast cancer cells . In another combined in vitro and xenographic model, thrombin markedly upregulated chemokine growth-regulated oncogene-alpha (GRO-α) in breast cancer cells as well as endothelial cells. Thrombin and GRO-α lead to increased production of various vascular regulatory and growth proteins important in angiogenesis and tumor progression, such as MMP-1, MMP-2, VEGF, angio-poietin-2 (Ang-2), CD31, and VEGF receptors KDR and the GRO-α receptor, CXCR2 (Figure 3). Anti-GRO-α antibodies effectively decrease thrombin-induced angiogenesis in endothelial cells, and injection of GRO-α KD (GRO α knockdown)-4T1 murine mammary cells in mice results in decreased tumor growth, angiogenesis, and metastasis, supporting the important role of thrombin in breast cancer progression . TF-FVIIa-Xa complex results in thrombin generation. Thrombin is a potent platelet fibrinogen to fibrin, contributing to tumor metastasis. In breast cancer, thrombin acts through protease-activated receptor-1 (PAR-1) receptor and markedly increases growth-related oncogene-alpha (GRO-α) production. Thrombin, PAR activation peptide, and GRO-α all lead to increased production of matrix metalloproteinase (MMP), vascular endothelial growth factor (VEGF), angiopoietin-2 (ANG-2), CD31, and receptors KDR/CXCR-2 in endothelial cells, contributing to tumor growth, angiogenesis, and metastasis. Act. Plts., activated platelets; CXCR2, chemokine receptor for growth-related oncogene-alpha; KDR, kinase insert domain receptor (vascular endothelial growth factor receptor); Plts., platelets. In certain models, TF signaling was demonstrated to be crucial for breast cancer growth . These findings are perhaps explained by the fact that TF can enhance angiogenesis indirectly through thrombin generation, fibrin deposition, and platelet activation [68, 72]. Moreover, it is well established that thrombin stimulates platelets to release pro-angiogenic proteins, like VEGF, from platelet alpha-granules . Under normal circumstances, fibrin, generated from the coagulation cascade, provides a proangiogenic matrix that promotes new blood vessel growth . In vitro studies demonstrate that, in addition to a clotting-dependent pathway, direct TF/FVIIa-mediated PAR-2 activation induces production of angiogenic regulators, such as IL-8, CXCL1, VEGF, uPA, and PAI-1, as well as immunomodulators like colony-stimulating factors (granulocyte macrophage-colony-stimulating factor and macrophage-colony-stimulating factor) from breast cancer cells . Several of these secreted proteins play important roles in angiogenesis, apoptosis/survival, cell proliferation, cell migration, and cell adhesion. By virtue of its role in normal physiological processes, the fibrinolytic system has also attracted attention as a possible mediator of breast cancer progression. The fibrinolytic system is central to controlling thrombus dissolution (for example, upon wound healing). Hence, in recent years, researchers have begun to unravel the pathophysiologic role of the fibrinolytic system in breast cancer progression. System components that have been demonstrated to play important roles in breast cancer include urokinase-type plasminogen activator (uPA), its receptor uPAR, and PAI-1 . The fibrinolytic system promotes tumor growth by several different mechanisms, including angiogenesis, suppressing apoptosis, proliferation of tumor cells, and degradation of extracellular matrix . Clinically, increased levels of both uPA and PAI-1 correlate with poor relapse-free survival and poor overall survival in patients with breast cancer . Particularly in patients with untreated, lymph node-negative breast cancer, combined uPA and PAI-1 levels demonstrated a strong prognostic ability, and elevated levels of uPA and PAI-1 in these patients might be used as a marker for high-risk disease and to determine the need for chemotherapy . One mechanism by which uPA, PAI-1, and uPAR mRNA expression can be increased in human breast cancer is via activation through the TF-FVIIa-PAR-2 complex . uPA converts plasminogen to plasmin, which degrades the extracellular matrix to assist in invasion and metastasis . 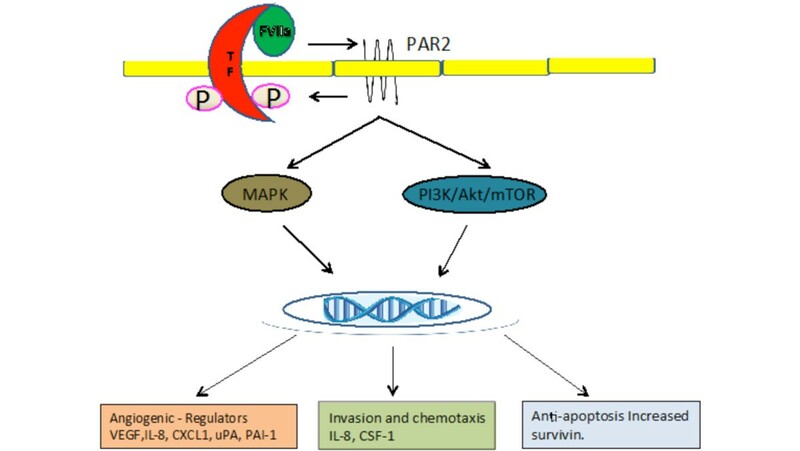 Malinowsky and colleagues [76, 77] have also demonstrated a positive correlation between uPA/PAI-1 with PI3K/Akt and MAPK signaling pathway molecules in tissue biopsies obtained from patients with breast cancer. These pathways are thought to promote tumor growth by suppressing apoptosis and inducing proliferation [76, 77]. uPA also activates tumor-derived PDGF-C in breast cancer cell lines and this enhances cell proliferation, cell growth, and tumor cell motility . Apart from increased plasmino gen activity seen in tumor cells, at least two human breast cancer cell lines - MCF-7 and MDA MB 231 - have also been shown to promote angiogenesis by enhancing uPA and PAI expression by endothelial cells in in vitro models . In women with breast cancer, inhibitors of coagulation such as low-molecular-weight heparin and warfarin have been studied in clinical trials [80–84] (Table 2). Clinical trials presented in Table 2 largely enrolled patients with other malignancies, and patients with breast cancer represented a minority in most trials. The single trial using warfarin therapy that enrolled only patients with breast cancer did not find a survival benefit with the drug at doses designed to attain an international normalized ratio of 1.3 to 1.9 (mean of 1.52) in patients with metastatic disease. It is unclear from the existing data which patients would benefit from anti-coagulants and at what stage of the disease these drugs would be most optimally used. The data in these studies and those available for other tumors suggest that patients with a lower burden of disease might benefit most from anti-coagulation therapy. The dose needed for any potential clinically significant anti-cancer effect is unknown for these drugs and may be less or more than that needed to prevent thrombosis. Establishing doses for these drugs that might inhibit cancer progression is particularly important in order to minimize the bleeding risk associated with their use. In this regard, translational clinical studies are urgently needed. In addition, the use of these drugs in patients with specific cancer subtypes should be explored . New anti-coagulants recently approved by the US Food and Drug Administration in cardiovascular disease, such as rivoraxaban (an oral factor Xa inhibitor) and dabigatran (an oral direct thrombin inhibitor), have undergone no clinical study in patients with breast cancer. Similarly, we are aware of no trials that focus on inhibitors of fibrinolysis. Our current understanding of the role of hemostasis in breast cancer progression is still modest. However, the mechanisms and pathways highlighting the tumor-promoting effects of platelets, coagulation, and fibrinolysis are being increasingly identified. Many laboratory and animal studies have identified specific targets for hemostatic-targeted therapy that may be advantageous as adjuncts to existing cancer treatments. It is important to point out that the available evidence that supports the role of the hemostatic system in cancer progression extends well beyond breast cancer models. Although we have chosen to highlight only data that directly tested experimental or animal models of breast cancer, much additional and robust data exist in other tumor models that further support the role of the hemostatic system in cancer progression. Currently, clinical data are limited for breast cancer and all tumor types with regard to efficacy of targeting the hemostatic system. Given the well-delineated side-effect profile of anti-platelet and anti-coagulant therapy, the need for well-designed clinical trials and translational studies is imperative. The fear of bleeding complications with all currently available agents that inhibit the hemostatic system is real. However, relative to the toxicity of agents currently used in the neo-adjuvant - and, particularly, metastatic - setting, these drugs may be well tolerated (at least on the basis of current dosing levels established for the drugs in other clinical settings). The cost of these agents is also substantially less, and availability is, in many cases, immediate. This work was supported by a grant from the American Cancer Society (116284-MRSG-08-111-01-CCE) and the Vermont Cancer Center at the University of Vermont.